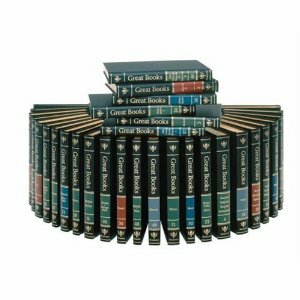 A major initiative of this blog is the tracking of a seven-year project to read through the entire 10-volume Gateway to the Great Books series and 60-volume Great Books of the Western World series (now both out of print but available from the linked sellers). You can read the initial post outlining the plan here. The tables of contents for the two series are here and here. I later amended the project slightly by adopting a schedule of readings that drew from both series simultaneously rather than finishing the Gateway set in its entirety first. Here is the post explaining the change and the reasons behind it. This post addresses the question many have asked about the absence of the Bible from the Great Books of the Western World series. Each week’s reading list contains at least one selection from each of the four broad categories of literature included in the Great Books series: Imaginative Literature, Man and Society, Natural Sciences, and Philosophy/Theology. I am building an index of posts I have made as part of this project. You can find it here. Anyone who is interested in this project is invited to enter the Great Conversation by participating at whatever level is comfortable. Pick a selection from the most recent week’s list, read it, and offer your thoughts or ask a question in the comment section. Or you can mine the archives for other works that interest you and read and comment on those. If you are really ambitious, go back to the first post and start from the beginning! Schrödinger, Erwin: What Is Life? I’ve subscribed to your blog (just today), and I need to ask: is there an online version of the Great Books? I would love to own them, but I prefer them as e-books. I’m a librarian, so I can easily check them out of my library, but owning them would, of course, be my preference. The only electronic version of the Great Books of the Western World series (that I know of) is available by subscription to the MyILibrary database. Your library may have access, although access is a bit clunky. Of course, electronic versions of individual works are usually easy to find, and I link to many of them in my weekly posts. I’m also a subscriber to your blog, and needed to ask: I am looking for a credible source to purchase this set for myself, and my efforts thus far have proven unsuccessful; Could you point me in the right direction? Stephen, I’ve linked to Amazon.com sellers on this page. That’s how I acquired my at-home sets (both the Gateway to the Great Books and the Great Books of the Western World series), and everything went very smoothly on both orders, so I’d recommend that. If you purchase through my link, you’ll help me defray the costs of the site a bit; that would be much appreciated. – St. Exupery “Terre des Hommes,” “Vol de Nuit,” etc. Rather than being a list of unconnected peaks, there should be a better attempt at some cohesion so that the list forms a comprehensive understanding of the western culture. Some sort of structures from other cultures should also be here Dante, and more Irish literature seems to be missing. I’d definitely take out Marx and some Lincoln speeches and add instead some liberitarian speeches (Basitat, Webster on the Draft). Chris, I have good news for you: many of the titles you list above are actually part of this project. We simply haven’t gotten to them yet. At the time of your comment above, we’ve made it through less than 30% of the page count of the two series, and only pieces already completed or in progress are listed on this page. I’d suggest taking a look at “The Great Conversation” or Volume One of the Gateway to the Great Books to learn about the rationale behind the pieces selected for the two series. I subscribed to your blog today and would like to know if I can receive weekly posts from the first the first week so that I can start from the beginning? I can’t seem to figure it out. Hi, Gary, and thanks for subscribing. The best way to start from the beginning is to go to the index of posts here: https://westerntradition.wordpress.com/great-books-project/great-books-project-post-index/ I don’t have an autoresponder set up that will enable people to get a weekly email beginning with Week One. I just discovered your blog and am looking forward to following along on your project. I’m curious as to how fast you read. How long does it take you to read the 110 pages you schedule each week? I’m sure it varies based on the complexity or difficulty of the specific work, but what would be your time spent reading? Thank you. I usually spend between 5 and 10 hours per week on the readings. I recommend that anyone who finds that too grueling simply proceed at a slower pace (e.g., taking two weeks to do each set of readings) or choosing just one or two genres to read from instead of all four. I’m glad to have you along for the ride! I find what you are doing to be quit amazing (and inspirational). About 2 years ago I found a first edition of this set in an antique book store for only 70$. I had never heard of the set before, but upon seeing the vast amount of works it included – namely the rarer philisophical and scientific works catching my eye such as Archimedes and odd ball works by Aristotle – and the lack of any redactions or abridgments within the works, I snatched the set immediately. It wasn’t till yesterday that I read the first volume however, the great conversation. I was first under the assumption that I would read straight through the set of books, but later decided it would be a bit redundant, as I probably wouldn’t retain as much information than if I were to split up a few of the collections and essays and do a little jumping around. So, I then came across the ten year reading plan in the back of the great conversation which seemed quit intriguing at first, but when closely inspected I realized it omitted quit a few works and on top of that there was just too much zigzagging, even mid novel in some cases. So, I have come to the inevitable conclusion that I will need to do research on these works and create a reading plan in the order which shall best suit me, as well as ordering them in a way which will lead up to the harder works. I very much like the plan you have and want to say that I will probably refer to it as a foundation for mine. With that said I have a few questions I’d like to ask before embarking on my journey. 1. Who was the translator for the works of Homer in the second editon? In the first they are done by Samuel Butler, and to be honest, I don’t really care for them. Rather than using the Greek names of the gods the Roman ones are used which I find quit odd and a bit confusing at times. If this is the case I might consider either trading my set out… Or just finding a decently priced second edition to accompany the first… One can never have too many books laying around! 2. Once you complete the Great Books series, do you intend to read the yearly installments that go along with the set and include further readings which have contributed conversation. Likewise, do you intend to read any of the works listed in the syntopicon after your endeavor? 3. Finally, how was it that you chose the order of your reading list. Even if you do it week by week, I’m sure there must some logic behind it. 1. Richard Lattimore is the Homer translator for the 1990 edition. 2. I am considering going through the Great Ideas Today series and/or works from the Syntopicon and the Gateway to the Great Books bibliographies after this seven-year plan is completed. I don’t have the Great Ideas Today series right now and would have to track down a set. 3. I started selecting works from the graded reading plan in Volume 1 of the Gateway to the Great Books series, beginning with the easier works and gradually working up to more difficult ones. I also have a spreadsheet that tracks the page count I’ve completed in each genre so I can keep the reading selections balanced from week to week. What would be really great is an audio version as I am sure that many spend hours driving every day…. Actually, one of our readers is working on that . . . I am glad I came across your blog. Do you have any update on the audio work that was being worked on referenced in your 2013 comment? Check out this collection of “Great Books” audio readings over at LibriVox. It isn’t the entire set, but the list is being updated as recordings are completed. Related to Number 2 – this is the extensive list that I asked about (see below) and inadvertently was looking at the Index of Holbrook Jackson’s Anatomy of Bibliomania. I have been a lifetime fan of Adler and his Grand Experiment and have followed the adventures of the Great Books as educational tools and curricula for colleges and universities. This list of additional readings became salient to me when I looked at the Harrison Middleton University and they alluded to the fact that this Bibliography was in fact the most pertinent aspect of the reading experience – even more fraught with value then the GB set themselves (although this is arguable at best) – I think it would be profitable to spend time going through segments of these books and pieces and the interesting thing is that many of these works are on the Internet Archive – it is a lifetime of biblio-riches that seemingly would never give out and/or run dry. Wonderful project! I’d like to jump in and start reading wherever you’re at, so I can join the ongoing conversation. I cannot find your current reading list. Am I looking in the wrong place? The index of posts is not up to date at the moment. If you go to the blog home page, the most recent Great Books post was on 12/23/2013. I try to post every Monday. Just came across this after purchasing the great books set myself. It is a very helpful set for research—the first two volumes are invaluable. However, the text is deadly small for me. Would be interested in hearing your thoughts. Thinking about picking up this set on ebay. I have been a fan of the Harvard Classic for many years and recommend that if you can purchase them cheaply they are well worth the effort – used book sales usually have a set or two so you might check these out as well. While I understand the plan to read through the Great Books (proper) I found the vast works set down in Index I a fascinating tour de force and one that has been overlooked – overshadowed by the GB Manifest – for instance D ‘Israeli’s Curiosities of Literature (three volumes) is a brilliant work that is hardly ever attended (to) – my plan for a doctorial thesis is to utilize this Index (I) as a catalytic agent for the understanding of the Humanities. I was wondering what you thought of the Index and do you have any plans to incorporate these works into your overall reading purview. Dana, I’m not entirely sure what you’re referring to as “Index I.” Are you referring to something in a specific volume of the Gateway to the Great Books or Great Books of the Western World series, or something else? Sorry I should have been more succinct in my post – at the end of The Syntopicon Volume II there is the Bibliography of Additional readings (it was Index I in the first edition of the GB) – I know this will lead you to the correct area (pps. 909-996. Sorry for this faux pas – hope you can comment on this list. The Index I that I referred to was from Holbrook Jackson’s Anatomy of Bibliomania; I was very excited that there was a Great Books site that I could avail myself (of) that I inadvertently mentioned this Index which is also a wonderful resource for bibliophiles and the reading elite. Freud as great books is in my view a mistake. A far better choice would be Albert Ellis’s Reason and Emotion in Psychotherapy.